The relentless and endless war with the Thals has continued, and a vast transparent dome now protects the remains of the Kaled city. Rescued from Thal hands by the amoral but determined Lieutenant Nyder, Davros finds hmself forever changed and committed totally to the utter extermination of the Thal race instead of striving simply to attain knowledge and to satisfy his morbid curiosity. With the Kaled gene pool stagnant and on the verge of becoming unviable for continuation through purity, Davros asks for control over Kaled offspring, not getting his way uncontested but eventually securing the final necessary piece to continue his race’s inexorable march to their ultimate fate through use of the ominous nursery. 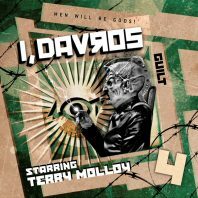 ‘Guilt’ shows Davros at his most megalomaniacal, and Terry Molloy seems to delight in letting down his character’s pretenses of tempered wrath and forced niceness from earlier tales to ruthlessly show the single-minded determination that now fuels Davros, acting with a measure of civility only when he receives exactly what he wants. While not wholly surprising given the singular fate that this series is building to, it’s nonetheless chilling to experience his pride that results from telling the Council members that the anti-radiation drugs he has formulated for them are, in fact, capable of causing arterial aneurysms, a capacity he is all too eager to show with a gleeful proclamation of extermination. This is the moment Davros has been waiting for all along when he can finally seize power, and the moment is as powerfully triumphant as the gradual buildup over three-plus releases needed it to be. Some three decades after bringing the brutally calculating Nyder to life in ‘Genesis of the Daleks,’ Peter Miles returns to the role and instantly establishes the repulsive enthusiasm with which he throws himself behind Davros’s corrupted ideals. He is harsh and intolerant, and his acceptance of the mutations and his aims for higher rank and status fit in perfectly with Davros’s ultimate plans, a fact underscored by the more familiar and almost lighter terms of their conversations together. Of course, the progress and inevitable success of Davros’s plans tie directly in with the title of ‘Guilt,’ with everyone on the planet sharing in the blame. It’s perhaps unsurprising that individuals like Nyder and Nicholas Briggs’s Thal Baran have ended up in positions of power after the centuries of interminable conflict, but the fact that the Kaleds in power have allowed Davros to continue on for so long due to the promise of wartime gains makes them every bit as guilty as those on both sides who have extended the war for so long as well as Calcula and Yarvell who each played her own role in Davros becoming the man he is. I, Davros is the final outing for Gary Russell as Big Finish producer, and it’s fitting that his tenure ends with this stunning success that completes the gradual evolution of a man of destiny to his deranged state that so diametrically opposes the Doctor’s moral code, setting him on an inevitable course of conflict that would help to shape the universe as a whole for better or for worse. Given that ‘Guilt’ only has one path it can possibly take, writer Scott Alan Woodard is still able to include some genuine surprises, and the nuances of the performances and incredible atmosphere help to make this a fitting conclusion to this small range that leads perfectly into Davros’s on-screen Doctor Who debut.